"The internet is changing writing and publishing. Is publishing on the net, through e-zines and blogs, a great way to get to read the thoughts and experiences of people all over the world? Or is it just too much self-published, unedited, unsubstantiated opinion?" "What seems to happen online is that articles hit the spot because they're tapping into concerns out in the public arena, and articles are generated from this and comments are generated from this, with their own momentum." "The mainstream media did cover it for some quite short period of time. After that the issues, I think you'll probably agree with me, tended to go underground, and people were communicating online about what was going on, but the mainstream media was turning down articles from people who knew what they were talking about, like Julian Burnside very, very quickly was told that they'd 'done that issue'." This is a copy of the transcript appearing on the Radio National Big Ideas website. Ramona Koval hosts a forum on the way the internet is changing writing and publishing. Is publishing on the net, through e-zines and blogs, a great way to get to read the thoughts and experiences of people all over the world? Or is it just too much self-published, unedited, unsubstantiated opinion? Joining Ramona for this discussion are the writer and publisher Hilary McPhee, one of the founders of New Matilda on-line magazine; Andrew West, a journalist who writes both for traditional newspapers and on-line publications; and Suad Amiry, whose emails to friends all over the world about her experience of the Palestinian-Israeli conflict resulted in the book Sharon and My Mother-In-Law - Ramallah Diaries. Ramona Koval: On ABC Radio National, this is Big Ideas. Hello, Ramona Koval with you. And today, a forum all about writing and reading in the new media. The digital age has brought all sorts of new possibilities for ways that any of us can communicate our opinions, experiences, ideas and dreams to people near and far, through hubs and blogs, e-zines and online forums and internet publications. Today we're talking about the opportunities and the difficulties that publishing, writing and reading in the new media presents. And also how it's being used for political activism and campaigning. This is a forum that I chaired earlier this year at the Sydney Writers' Festival, with three guests. Hilary McPhee, who's a founding member of the board of New Matilda, the online magazine started up in Australia in 2004. She was also at the time of this forum, the magazine's editor, a role that she's since handed over. Hilary McPhee is a writer and publisher with a unique perspective on the changes that have taken place in publishing since she began in the field in the 1960s. There was also Andrew West, who's a journalist, who currently writes for The Australian newspaper and for New Matilda. He's got a wealth of experience writing for mainstream newspapers. In addition to The Australian, he's written for The Sydney Morning Herald and The Daily Telegraph, and overseas for The New York Times and The Christian Science Monitor. And we were also joined by Suad Amiry, who's actually an architect, but she's also the author of Sharon and My Mother-in-Law - Ramallah Diaries, which started, as she describes it in the book, as a form of therapy between November 2001 and September 2002 after the Israeli Army moved into Ramallah where she was living. She sent emails to her friends and relatives about her experience of what was going on, and one of her Italian friends who was getting these emails got in touch with a publisher, so that the emails morphed into a book. It means that Suad Amiri has a very particular perspective on writing, politics and the internet. Now as with the panellists, I'm old enough to remember a non-digital world, and so our conversation began with what had surprised each of them about writing in the electronic media. Hilary McPhee first of all. Hilary McPhee: I didn't mean to become the editor of New Matilda, in fact it's a temporary post while we're getting the whole thing up and running really in a secure fashion. But it is going remarkably well. Doing an online magazine in some ways is not very different to doing a magazine in print, you think when you begin. And I imagined that my role would be simply selecting material and making sure the cartoons fitted the pieces and working with the Sydney-based team who are very much the ones who have the online experience, which I don't. But it has evolved in such an interesting way, because the comments that come into quite short articles - 800 to maybe 1,500 words - start coming in the minute you put the material out there every Wednesday afternoon. And people to my astonishment aren't simply saying 'good article, so-and-so' or 'boring old pile of codswallop', they're actually immediately responding and having a dialogue with the writer, and the writer comes back quite often and has a dialogue back with the commentator. So what I think is coming out of this kind of forum is a very interesting exchange which is not moderated. Obviously I'm moderating what goes into the magazine to a certain extent but I am allowing the material to shape itself. But the comments are not moderated, they go up immediately and shape the dialogue from then on. So that's what surprised me, Ramona, and has been probably the thing that I think is going to evolve in a very interesting way as we grow further. Ramona Koval: Andrew, what about you? Andrew West: Hilary said she never envisaged editing a magazine like this. I never envisaged writing for a magazine like this, given that at the age of 37 hurtling towards middle age, I still can't send a text message on a mobile telephone, and given that the past seventeen years of my career have been mostly working in the conventional print media. But I spent three years in the mid-'90s living in the United States - the mid to late '90s - and that was where online publishing, particularly for a specialised and politicised audience, really took off. And it impressed me there that first of all the barriers to entry for people wanting to set up a political magazine, or a specialised cultural magazine, were so much lower than they were if you had to do it in ink and paper. Now I still love the idea of writing in ink and paper, I mean I make my living writing for a newspaper, I've written books, but nonetheless this is a very exciting medium in the sense that it democratises the media. There are two forms, of course; there is a kind of anarchic blogging, which is something that I'm not particularly into, and then there is a more mediated, edited, but nonetheless still far more democratic form of media that New Matilda represents. But the thing that I saw, as I say, in the United States was - particularly with the rise of the right in the US, and given that the right controlled most or many of the establishment media outlets, given the rapid concentration of media ownership - here was a way for progressives to fight back and, particularly given the appeal that new media has among younger people, here was a way to reach an audience that was energised. And of course you only had to look at what Howard Dean was able to achieve, I mean alas he didn't win, but you only have to look at what Howard Dean was able to achieve using new media, when he was running for the Democratic nomination in 2003-4 - here was, as I say, a medium that really was both democratic and energetic. Ramona Koval: And Suad, from what you write, probably you didn't imagine that you were going to have your personal journal available for the world to see. Tell me about how you came to your new media role. Suad Amiry: First, I would like to tell you that in general in Palestine if you were under 40, then you used that media very comfortably. If you are above 40, you feel a little bit awkward, and I am very awkward, so you can tell my age. And for me, I would like to just say as an architect, I was always obsessed when I wrote by hand, I was always obsessed by the way the page looked like and how my handwriting looked like. And that really took lots of time from me, and in that sense I was liberated by writing on a computer. And second, I am dyslexic, I can never know how to write the word 'happen', whether it has double-p or one p. Paper, double-p or one p. So in that sense using the media, the computer, the email has been quite liberating. Not only that, when you write an email you don't feel that you have to write good English. I am sure many of you are insulted by that, but it's true, you know, I just sit there and write things with small letters, no capital letters, double-p will be fixed. So coming to my book, Sharon and My Mother-in-Law, I wrote it during the Israeli invasion of Ramallah, and my mother-in-law who lives alone, happened - I had to bring her to live with me for human reasons, which created lots of tension inside the house - and really at the end of the day I had to retreat to my room, sit on my personal computer, and just write what happened to both of us; there would be Israeli soldiers outside, and my mother-in-law inside, no comparison of course. But I sat there and really wrote, you know the Jenin camp being bombarded and Palestinians under the rubble, and my mother-in-law making marmalade and being concerned about whether we had sugar or not. But I wrote in the most informal way and the open way and I sent it as emails with no editing, with double-p with apple, or one p, I don't know, and it got to friends, and it was through that very sort of free way of writing that it got to my friends who ultimately took it to a publisher. Ramona Koval: But there is this element of self-publishing in the digital media, as the blogger, that you can say anything, you can get it out there, you don't have to worry very much about who's reading it or how many people are reading it. And it makes an older generation of writers a bit scornful I think. I think that's how we came to the idea of an unmoderated journalism, an unmoderated way for anybody to say anything without being edited, without having somebody's shaping hand. But younger people seem quite unfazed by self-publishing, also by small audiences. And there also seems to be no over-obsession with polish, the kind of paper you use, the kind of set-up and the colours, what the photographs look like and all of that stuff, which obsessed writers of an older generation. I mean do you think that this means that the times of gatekeeping in traditional publishing are over, and if they are, what are we losing? Hilary. Hilary McPhee: I don't think they're over for a moment, but I think they're evolving and I think we'll have parallel, obviously we've got now, parallel media, and this is the online moderated forum I guess is how I'd probably describe New Matilda, is just another version of all this. But the thing that interests me about it is watching people, as I said before, watching people's responses to the media, and trying to fathom why some articles get more response than others. Because when you're producing stuff in print in a print journal, you don't really know what's regarded as essential reading by the readers out there, unless somebody tells you you've got to read something in Eureka Street or something. But this doesn't happen very often, that people ring each other up and say, 'Read this, read this'. What seems to happen online is that articles hit the spot because they're tapping into concerns out in the public arena, and articles are generated from this and comments are generated from this, with their own momentum. Now when I say I am choosing what goes into the magazine, I am commissioning certain writers regularly, and Andrew, thank goodness, is one of them because he's a very valuable one to have because he moves between two different media, but I also get a huge amount of unsolicited stuff each week, which shapes, I realise, the content of the magazine. I'm not sitting there thinking, we've got to go for this issue and that issue and that issue; it's the way the contributors are using the site as a kind of group blog in a way, to highlight the issues of concern to them. When I first took on this role I used to panic on a Monday night (we publish on a Wednesday) thinking we've got nothing on the Budget, or IR, or the death of the Pope, but I've learned to completely relax because on Tuesday in they start coming, and they're of an amazing high calibre, people can write out there, and I of course choose between them, we don't want an entire issue on the death of the Pope, but we had, I think, three very good pieces from very, very different perspectives on the death of the Pope, which created a bit of an uproar on the site, and so it went on. But the moderation that's happening is simply I suppose about keeping watch on how the comments are going, how the cartoons relate to the pieces and so on, it's not actually controlling in the way an editor of a literary magazine or a political magazine would control the debate. So it's freer, and I'm very interested in that. Ramona Koval: Andrew, what about you, when you write for The Australian, I imagine that it wouldn't be as easy to get some kinds of writing, compared to if you just send them to Hilary. What do you choose to write for The Australian, how do you choose which piece to send? Andrew West: Oh well, I'm a staff writer for The Australian, I cover Australian politics. My brief is pretty narrow. It's a lot different with Hilary, you know, I receive a small fee for writing pretty much anything I wish. Hilary however is understating, the importance of I think her role and the role of editors on the new media to this extent: that the New Matilda is rigorously edited, it's democratic in its sensibility, it's progressive in its politics, but it is still a high quality, very well edited ... I mean Hilary is a pioneer of Australian publishing. You don't get any old crap on it. This is the difference between - and this is one very important difference between an online magazine like New Matilda in Australia; Slate, Salon in the United States, and an ordinary old blog. Now blogs are wonderfully, as I say, anarchic and democratic, but they are also dangerously inaccurate at times. Of course an exemplar of this is Matt Drudge, who ran his own site out of the United States you know, he broke the story of the Clinton Lewinski scandal, he also pretended to break a story about John Kerry's mythical affair with an intern, it didn't happen, but before anyone could - and I was in the United States when all this started to roll last year - before anyone could control it or answer the inaccurate charges, it had run out of control. Now there's a big difference I think between that kind of sometimes irresponsible rumourmongering and a meticulously edited magazine, and I think that's a very important distinction. I'm very wedded to one concept, that is the New Matilda-, Salon-, Slate-style concept. I do have concerns though about the completely unmediated blog, not that I think we should do anything to stop it, but we ought not elevate it to the same level. Ramona Koval: Suad, what about in Ramallah, are there a lot of people writing their own blogs and giving views from different parts of the city? Do you read other people's views from other parts of the city? Suad Amiry: No, I think in the case of Palestine, it's quite interesting. This whole new media ... because you have to remember that we have been living under occupation for almost forty years now, thirty-eight exactly now, and the journalism or books have not been available. I mean we are really isolated, in a sense, and if you take the generation which is less than forty, they are very, I mean they have opened, or they have broken their isolation through this new media, through emails, and I mean my reaction to it is very different from younger people, people with whom I work in the office. They find the emails and they find the blogs and the new media a liberating way of just being somewhere else, and you have to take into consideration that the majority, 70 per cent of the Palestinian population is less than 25. So this is really their media, and we represent the minority in our society, those of us above 45 and 50. For me it's quite interesting that this for them is quite liberating because we don't get The Guardian, we don't get many of the newspapers. The only newspaper we have is two newspapers, one in Jerusalem, Al-Quds, and in Ramallah, in the West Bank and Gaza, Al Ayyam, and that's about it of our exposure. 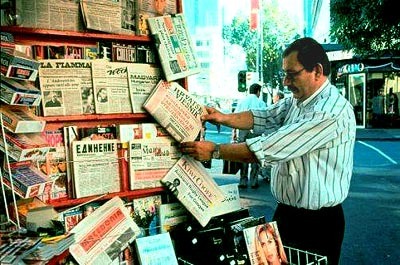 So through the new media we can get into all the newspapers in the Arab world, or in Australia. So it has a completely different dimension politically, and getting really people out of that prison, as it were. Now as far as I'm concerned, I know that you wouldn't be happy with me, but if I don't have my book in the form of a book, I am not satisfied, and when someone told me, maybe your book could be put on the internet, that's the way it's going to be published; okay, I mean if there is no other way, fine, I will settle for that. So I still have a great passion for a book. And also, part of my problem is really the time. Being on with the new media, being from my generation, I am very slow, so just to be able to have that ping-pong answer for, like a get a lot of emails, people writing about my book or responding to my book, but really, to be able to be part of that world, you don't have to have a job in your life. I mean I don't have the time for it, I don't know how people can keep up with it. It gets through at a completely different speed and different world. Ramona Koval: Suad Amiry mentioned that there's a whole different pace to writing and reading on the internet, something she's not entirely comfortable with. But there's also the speed with which conversations can become global on the net, and how that can have a runaway political effect. In an earlier conversation I've had with Suad Amiry, she said she wasn't always entirely comfortable with this either, citing the example of an internet dialogue amongst a group of people within the Palestinian territories which was critical of the Palestinian authority, and which she thought was harmful to international opinion about the territories. But as I put to her, is this a reason for caution or control? After all, once something's on the net, there's no controlling it, is there? Suad Amiry: No, I am not for control, absolutely. On the contrary, the more people get exposed, this is wonderful, I think in the Third World countries, it's wonderful to be beyond the censorship, and this is very liberating, I think. And you know, this morning we were having a discussion about the Palestinian authority being corrupt and not corrupt and I was from a point of view, I know it's probably corrupt, but this is an internal issue, and I was just saying that to make that an external issue, gives an excuse for most people who don't want to support Palestinians anyway, give them an excuse for not supporting us. But I agree with you, I mean we should have different points of view and this is what freedom is all about. But you know, my problem again with the new media is really, it's very difficult to be selective. I mean you have to read through so much junk to be able to come to something worthwhile reading, and this is my problem with the new media, there is so much there. And of course it's liberating because there is, like if you take the newspapers or the magazines you have The Guardian or The Sunday Times, and then it leaves it to any person to stand up and there is nobody in the editor of The Guardian saying yes, I accept your article, or I don't accept. So I can put it on the internet, that gives a free choice. But at the end of the day we don't have time to just go through ... I mean I have difficulty really finding what is it that is worthwhile. But in the Third World countries I think it's very liberating not to have censorship over many of the issues. Andrew West: I don't think ... you said we'd be terrified to hear what you said ... no I think that both media are entirely complementary, and there is a certain romance, I agree, that something's not really a fact until it's on paper. I can tell you, and I think bibliophiles will always want something to put on their shelves. The great thing - and we've seen this in the United States - is there's now a collaboration between a lot of new media and traditional media, The New Yorker magazine has a joint subscription offer now with Salon magazine, and these are things that I suspect that as New Matilda evolves and building success upon success, I wouldn't presume to speak for the company, but they're things that I suspect we could consider here in Australia. The important thing to remember too about one of the current limitations on new media, and it's certainly not an insurmountable limitation, but much of what appears on the internet is not reportage as opposed to comment; it's wonderfully freewheeling democratic comment, but sometimes I'm not sure that it's adding much to the canon of information. And there's one reason for that: that to do investigative journalism, you simply have to have a very big budget, and I can tell you, even working now in conventional newspapers, it's very expensive to put a reporter on a job for three months and risk them coming back with nothing, which is essentially what you have to do with investigative journalism. Now I think as new media evolves, as its profit base builds - because in the past it has been difficult to actually make money from the internet, because people don't think they should pay for it - I think as we get more money, and as we get more readers, I think we will look to the day when we're commissioning articles, when we are commissioning reportage, not merely comment. At the moment though, I admit that the limitations are a lot of what is on the internet is - there'll be a link to a The New York Times article, or to an article in The Oz, or an article in The Guardian, and then a range of comment on it, which is great, but it's not originating anything. We have to add something, the challenge for new media outlets particularly structured, mediated, quality magazines like New Matilda is to add something new to the kind of canon. Hilary McPhee: I absolutely agree with you. I wish we could do investigative journalism, but in Australia, the mainstream media has a very short attention span, and I think we've seen an example of this recently, with the whole debate over mandatory detention, which after Tampa and SIEV X was in the news. The mainstream media did cover it for some quite short period of time. After that the issues, I think you'll probably agree with me, tended to go underground, and people were communicating online about what was going on, but the mainstream media was turning down articles from people who knew what they were talking about, like Julian Burnside very, very quickly was told that they'd 'done that issue' by The Age. And there were other examples of that. Arnold Zable couldn't get published, for instance, there was a lot of - there was a sense in the media that we were getting that the issue was over. Now we knew it wasn't, obviously, and on New Matilda we kept, I think ever since we began, we've had at least one article, sometimes two or three a week coming through from people writing about conditions in detention centres; conditions that the staff have to work under, the ownership of detention centres, and so on, stuff that is never covered by mainstream media. Now only very recently the media has shown an interest in this again and I suspect the online media has had some kind of effect by being able to tell the stories of individuals, being able to put a face to Naomi Leong and a voice to people like Peter Qasim and so on, and the media suddenly sits up and takes notice and so does the public, and then you get a Private Member's Bill. So I'm not overestimating the power of a little tiny website like New Matilda, but it does have links to ChilOut, to Jack Smit's [Project SafeCom's] website, and a whole lot of other websites that are concerned with the issues, and I think the cumulative effect is actually quite a powerful political one. Ramona Koval: Did you have political activism in mind as your original concept? Hilary McPhee: Absolutely. I'll tell you very quickly. New Matilda was set up by a whole bunch of people, I think about forty of us got together about a year or so ago, very concerned about truth in government, and about the mainstream media I suppose just losing interest in the issues that we regarded as essential for the kind of social democratic Australia we wanted to see happen. That was the motivation and we all put a bit of money into it, and we're still having people donating so the thing can keep going. So activism was absolutely fundamental to it. Andrew West: Could I just make a point also that I think magazines like New Matilda are reviving a very old and proud tradition of political pamphleteering. I think, I mean I wouldn't be egotistical enough to think that - but I think we're kind of reviving almost what Tom Paine did in the late 18th century. He was a prodigious and radical pamphleteer and of course this was - many people in the United States when the new media started to develop in the mid-'90s, saw this as a way of reviving if not crudely partisan kind of publications, publications with a point of view. And of course the other thing that New Matilda is developing is a policy hub. In the absence, frankly, of an effective federal Opposition, it is falling to citizens outside conventional politics to start developing an alternative vision. And that's not something that you can get in a conventional newspaper, or a magazine. So I really think this is an added layer to what we're doing. Ramona Koval: Well I mean conventional newspapers, perhaps like the one you work for, do their policy formulation behind closed doors, don't they, and this is at least policy formulation in public. Hilary McPhee: We're talking about public policy. Ramona Koval: Yes, I mean public policy, too. Andrew West: Well I mean every newspaper has, and is entitled to have, an editorial point of view, and I would hope that that editorial point of view is sharply differentiated from the reportage. You look at The Wall Street Journal; The Wall Street Journal editorial pages could be written in the Heritage Foundation and usually are, but as I have friends who work on The Wall Street Journal, they are meticulous in guarding their independence as reporters. Suad Amiry: I would like to add just something about the activism, because I think it connects to the condition of Palestine, and I think that websites and internet and this new media has given lots of political activists, especially the younger generation in Palestine, they've always felt that they have not been able to explain the Palestinian situation, the youth, the prisoners, women, children, and I think in our case there is a lot of political activism going along. I know there are 'wars' with the young Israelis and the young Palestinians on their websites; I don't know how it goes exactly, but I know that there is a lot of communication happening between the Israeli young people and the Palestinians talking to one another, but sometimes cursing one another, and sometimes bombarding. I don't know how it happens but also there has been a very interesting, for example, project which is happening through the new media between the Palestinian refugee camps in Lebanon with their sisters and brothers in Palestine. So when you ask about political activism, I think there is a whole new dimension of exposing art or politics and I think it really liberates from the mainstream media, whether it's in art or music, and I've seen it in the case of Palestine where many times in the Third World countries, the number of people who use this new media is unbelievable. Ramona Koval: Suad Amiry, one of the speakers at the New Media Forum held at The Sydney Writers' Festival in May this year, which was chaired by me, Ramona Koval. The other speakers participating in this forum about publishing, writing and reading in the new media, Andrew West is a journalist both for traditional newspapers and online, and Hilary McPhee, one of the founders of New Matilda, the electronic magazine that's been running for a year now. And I put to Hilary McPhee the question of whether something like New Matilda would ever only be preaching to the converted. Unlike publishing a newspaper or hard copy magazine where you can hope that maybe on a train or in some dentist's waiting room, a person who's never bought that newspaper or magazine might well pick it up and read it, but there's nothing accidental or serendipitous about reading an online magazine or a blog, you have to actually log on to the site, you actually have to want to know and seek out what's there. So how do you broaden an online readership beyond those who are already in the loop? Hilary McPhee: That was one of the reservations I had, I must say, thinking that it would be inevitably a bunch of us with the same kind of political outlook, talking to ourselves, same generation even, that was a big concern. But it hasn't worked out like that. Ramona Koval: How do you know? Hilary McPhee: Well because of the comments that come on to the site. The subscribers are a very diffuse bunch, they're a very literate bunch. There was a big ANOP survey recently which is on the website, telling us what our subscribers were like, and they're reading two or three newspapers, they're subscribing to literary journals and so on. So they're a well-informed bunch. But their politics are certainly not old Labor, certainly not Whitlamesque, certainly not of the one generation. We've got quite a wide age group, and the younger age group is growing all the time, so that's very pleasing. That is a concern with a site that's subscriber-based that you are only going to attract a certain kind of person, but we get ferocious comments on the site as well as ones that just continue the argument in the same way. Suad Amiry: But isn't that true of mainstream media? Nobody would go and buy The New Yorker or Harper's if you were a right-wing. People are divided; who buys The Guardian, who buys The Sunday Times, but that's also the same thing, that you go where you belong, as it were. So why do you think that the mainstream media breaks that and the new media doesn't? Ramona Koval: Well just because you can accidentally read something that you didn't necessarily buy. Andrew West: But there is a wonderful little thing called Google. Or Ask Jeeves, or LookSmart or something like that, and you can stumble across it like that. Ramona Koval: Yes, that's true. I was just going to say that when I worked in talkback radio for the ABC some years ago - this is following from your question about what elicits a response - you found inevitably that if you framed a question in a certain way, if you made it intelligent and if you made it a kind of open-ended question, then you would get responses, and you'd get marvellous responses, very, very thoughtful responses. It doesn't need to be about nothing to get a response. What have you found about how you frame the writing? Can we talk a little bit about how we pitch things, what we write about, how we elicit a response? Hilary McPhee: This is something that I've found fascinating because - I'm going to generalise wildly here - but people who write in a way that closes the argument because of their expertise, tend to get very limited responses in online media. If they were writing a book, I don't think that way of writing would curtail their audience. But in online media where you're skimming, you're looking for something that grabs you, you want to be engaged by it straightaway. People who are prepared to take perhaps risks with themselves, expose themselves a bit, use their own experience to kick off an argument, get a much stronger response than those that don't. And women do it better than men, it's interesting, and certainly younger men do it better than older men. So there's a sort of pattern emerging in my brain which is feeding my prejudices obviously. But an example of this; we published some time ago a terrific piece by Joanna Mendelssohn, an academic who wrote about her mother, and it was picked up by mainstream media lately so a number of you probably would have read it in The Sydney Morning Herald, and it was a piece that was unlike anything I think Joanna had written before, in fact she told me it was, and she'd just banged it out very quickly and sent it off. And we put it on the site and we got the biggest response we've ever had to anything, and it was profoundly political because it was written about in the period when we were dealing with the abortion debate and it was being politicised pathetically and so on. But instead of just writing into the politics of it, she was prepared to use a personal story to illuminate. And the readers responded to that. So I'm developing all kinds of theories here, Ramona, some of them very ill-founded. And with academic writing, which was something I'm engaged with a lot these days, I'm very interested in ways academics can write into the public sphere, use their expertise to communicate the research they're doing, and so on. An awful lot of academics are not very good at this, and they're realising that they need to perhaps think about ways of doing it. We have a lot of academics writing for New Matilda now, who are responding to - I don't edit to anything like the extent Andrew's describing; we sub, but sometimes I make suggestions about moving things around and so on, and send things back if they're not good enough. And I think for some academics, sending off a 1,000 word piece to New Matilda they're a bit startled to have them knocked back, with a suggestion they might resubmit. And they're coming back, and they're better. And that's a great pleasure to me because there is a sense that reading on screen is different from reading on the page, and it's different from reading a book, a short article is different. So that's interesting. Ramona Koval: Suad, what about - you've found people connecting with your personal story? Suad Amiry: Yes, actually I would like to share with you some of my experiences concerning this book and the way it happened. You know, this book has two parts: Part 2 and Part 1, because it appeared in other languages, as two books. Now Part 2 of this book was emails. And it's true, when you sit and write emails for friends, as I said a minute ago, you are really free. In a sense, what counts is your emotions, your experience trying to explain to my relatives or my friends what does it mean to be under curfew, how my mother-in-law is giving me a hard time, how people are being killed in the streets of Ramallah; I mean you're just being yourself, and you're really not writing. In Arabic we have something called hakawaaty, you are a storyteller, so when you are writing on an email or in the new media, you are a storyteller in the sense of the emotions, and your emotions are not being watched or edited, your language is not being edited, so there is a lot of heart-to-heart talk, I think. Now as I told you, I wrote these emails for friends, and actually some of them I lost myself, I'm not very technically good, so every time my box is full, I just erase. And I erased lots of my writings, and it's only when the Feltrinelli publisher, it got to Italy and they thought they were wonderful, I had to send to friends, 'Please, do you have this email that I sent you around this time of year', and I re-collected them. Now Part 2 of this is really just unedited. And my husband, who is a sociologist, and he's an academic, and he doesn't write anything without it being edited five times, six times, rewritten, you know, dictionaries, all sorts of things. And when Feltrinelli told me 'Send us your manuscript', I sat there and said, send, you know, no editing. My husband was just - 'You must be crazy, you don't speak English very well, you make lots of mistakes, and you should have given it to an editor.' It's like, 'I don't care, they like it the way it is and I'm not going to do any editing'. Now once they published the first book, Feltrinelli came back to me and they told me, 'Suad, maybe you don't know it, but you are really a good writer, and we want to encourage you to write another book', and that was really scary because those of you who would read Part 1 and Part 2 - they're very different. When you start being a writer, (quote, unquote) then you are more conscious that you have a reader, and does the sentence read well? And I think it loses a lot of the spontaneity and the emotion; you become more obsessed with the structure of the sentence and the English, and meanwhile I think some of the emotion or some of the heart-to-heart goes away. And now I am in the process of writing a third book, and I am making a mess. Really, there is no good English, I don't know what the story is, so there is a spontaneity in the online writing that I unfortunately have lost, I think. Ramona Koval: Andrew, what about you? What do people respond to in your writing? Ramona Koval: No, that's what they respond with. Andrew West: They respond with outrage to outrage, I hope. I observe only two rules: one that I don't break the laws of defamation, I don't want the magazine being sued and tumbling down because of me; and I want it to be accurate. But as far as - I like to be as unrestrained as I possibly can. So if I think a certain unnamed world leader is a war criminal, I'm happy to say so. Unfortunately, of course, I don't get many people disagreeing with that point of view. But sure, it's an avenue for greater passion, I can't say it any better than that, I think. Ramona Koval: But unmoderated passion is not necessarily educational for others is it? Andrew West: As long as your statements are accurate. Hilary McPhee: You also write beautifully-shaped pieces. Andrew is a columnist for us and his columns have a shape which he's not telling us about. But you did tell me that you felt it was a very different medium to write for. Andrew West: Well if only because you're writing with such an explicit point of view, and you don't feel you have to observe some form of objectivity which quite correctly you must in news reportage. This is a magazine with a point of view, and anyone who knows me will know that I don't hold back with a point of view. I have an opinion on everything from underarm bowling to abortion, you know, and this is an opportunity to express those opinions. Ramona Koval: How do you find the expression of those opinions in this forum affects how you're read in the other forum, where you're not supposed to have opinions? Andrew West: Well I've made a pact with myself, no-one else, with myself, that I will not write about New South Wales politics or bloody Bob Carr, which is what I do - I mean I won't make life difficult for myself or my employer by writing about on the New Matilda, state politics. You know, that is an area where I exercise I think pretty strong impartiality, and am determined to do so. And it might be an unwieldy balance, but I think I'm working it out so far. Hilary McPhee: We do pay some contributors, very little, I agree, but people who live by their writing, I feel we should pay, and so we manage to. And the way we do it is by trying very hard then to sell on certain pieces each week to mainstream media, who then pay a reprint fee. Copyright remains with the author, always, but we ask for first go at it, and then it's out there on the internet and it's freely available. We give contributors who we don't pay - what we say to contributors is that we will pay you unless you can afford to donate back. That's the very clever wording we've got on the website, and a lot of them are generous enough to donate their work at this stage. And we say to them, you can have a gift subscription. That's how we basically do it at the moment. In fact we give I think contributors two gift subscriptions at the moment. About economic viability: I don't think we will ever be economically viable simply by subscriptions, and able to therefore pay authors large amounts of money, or even what they would be paid by mainstream media. But I think the kind of work we're doing on the site, which as Andrew reminded me I should be talking about, also involves policy development, does attract people who want to donate to a cause in a way. We're as much a cause as we are a magazine I guess. So funds can flow from other sources as well. But certainly we're not taking advertising at this stage and I can't imagine what kind of advertising we would take in the future. But viability I think for these kinds of sites, and there are many examples of US and UK sites that are like this, are based as much on donations as they are on subscribers. We do a lot of other things other than publish a magazine. One of the things that is attraction donations and sponsorship and so on, is a number of us got together a few months ago, and we realised, like everyone in this room, that this country is the only Westminster democracy without a Human Rights Act, and decided that New Matilda would be a good site to develop that, and we've asked George Miller and Spencer Zifcak in Melbourne to draft a Human Rights Act, which they've done, for a lot of debate to happen on the site, before we then start the whole slow political process of Private Members' Bills and so on. So that's the kind of activity that can attract funds as much as subscribers. And we're not doing it for money, we're doing it because we think it's important. Ramona Koval: Another question was addressed to Suad Amiry, wondering what the Israeli reaction to her book had been, and had the Ramallah Diaries been translated into Hebrew? Suad Amiry: Again, it was the email actually. When I wrote my emails I circulated them and among them was an Israeli friend of mine by the name of Dafna Golan and Dafna, I send it sometime in the evening, and next day, 7 o'clock in the morning, the phone rings, and Israelis bug us, even if they are our friends. At 7 o'clock, she woke me up, and said, 'Suad, I really love your stories, and I think every Israeli should read them. And I want to take them to my publisher.' So I said, 'Here I have another crazy friend'. The first one was Italian, I understood, I mean you expect the Italians to be crazy, but the Israelis usually are more on the serious side, but still, Daphna decided to take them to an Israeli publisher in Tel Aviv by the name of Bavel. And three days later I received a phone call from Chaim. 'This is Chaim speaking, Suad, we would really love to get your book published'. And so I was really delighted, but I was really concerned and afraid. 'Never trust the Israelis, maybe they're going to change my political line, maybe they're going to do lots of editing. Maybe this, maybe that'. And to be fair, he did not change a word. The only thing he asked me, and thanks to him, he said, 'Suad, it would be nice if the Israeli reader knows who you are. So it would be good if you can write me a story about yourself. Another c.v., because the book is quite funny, of course you cry but it's quite ironic, and he said, 'Don't send me a c.v. just write me something that the reader would know who you are', and I wrote the first story here which is 'I am not in the mood' and it's about an interrogation that happens with me as a Palestinian at the Tel Aviv airport, and it goes between the informal questioning of the interrogation and me giving a very, very short answer, by Yes, or No, because with the Israeli security, the more you give them the more you get in trouble. So I have this policy when I am on the Israeli Security whether any border, is if I can answer Yes, No, that's the end of it. But in it I say Yes and No, and for the reader I give the story of who I am as a human being where I was born, but the only thing they changed was the title. My publisher calls me and she says, 'Suad, listen, I really want to change the title because Sharon is like Mohammad in the Arab world, everybody's called Sharon, and if we say Sharon and My Mother-in-law - her husband's, the publisher's husband's name was Sharon,' so she said, 'Somebody would think that this writer is saying something about my mother, you know, and nobody would really realise this is a Palestinian writing about the occupation and about invading Ramallah, and do you mind if we change into Cappuccino in Ramallah, and of course the name did not come out of nowhere. There is a story in the book called Cappuccino in Ramallah and it has to do with the Israeli invading Ramallah, occupying the already occupied town of Ramallah. They came at 0430 in the morning and of course we were all asleep and all we hear is (buzzing), you hear the tanks invading Ramallah, about fifty of them, and we just happened to be on the road where all the tanks on the al-Irsal Street where all the tanks arrived from there, so of course everybody in town woke up and we put on the lights and some of us were scared and didn't put on the lights. And we lived in a house where the empty land right in front of us, and that's where many of the tanks landed, and one of the tanks, always, always for one reason or another, end up stopping exactly next to our kitchen window. Just really maybe a distance between here and that door, and that's our kitchen. So we woke up, we looked at the Israeli soldiers, we've seen them before, so I decided that's it, I want to go to bed, I was really sleepy. So sending my husband to come to me and he's very unlike me, you know, I love to sleep and he is an insomniac, so he comes to me and he says, 'Would you like to have a cappuccino?' at 4 o'clock in the morning. And I said, 'Yes, why not, cappuccino's nice.' So Salim goes to the kitchen to do the cappuccino and all of a sudden I remembered Oh my God, the cappuccino machine with the noise, it's going to do (hissing) probably we'll be both shot, you know, because the Israelis are very close and there is complete silence. So I ran to the kitchen and say Salim, don't, and he goes whoosh, and I throw myself on the floor just in anticipation of any shooting, and obviously my Israeli publisher liked that story. So she said, 'Do you mind if we call it 'Cappuccino in Ramallah'? And that's what it's called. But again, it's Part 2 of the book has been published, the second has not been published yet because I am very busy going around the world for my book and I haven't had the chance either to do it in Hebrew nor in Arabic by the way. It has been translated into seventeen languages, but it hasn't appeared in Arabic yet. Rachael Kohn: Suad Amiry, whose book Sharon and My Mother-In-Law -Ramallah Diaries began life as emails to her friends about life in Palestine. And also speaking at this Sydney Writers' Festival Forum on the impact of the new media on reading, writing and publishing, you heard from Hilary McPhee whose long-time involvement in Australian publishing brought her to be one of the people who established the New Matilda online magazine in 2004, which she also edited over its first year. And the campaign for a Human Rights Act for Australia started by New Matilda is now interested in your comments about the model Act that you can find on their website, and you can find links to that on the Big Ideas website. And you also heard from Andrew West, a journalist who writes both for a traditional mainstream newspaper, The Australian, and online for New Matilda. I'm Ramona Koval and this is ABC Radio National. Next week on Big Ideas I'll be in conversation with two writers, two blokes, Robert Manne and Martin Flannagan, speaking with them about the journey of their lives as writers and thinkers, and the influences on their ideas from football to their fathers, to the importance each of them places on feelings and values. That's at this time next week on Big Ideas.